Orange Beach AL condominium home for sale at Tidewater. 3BR/3BA Unit. This is a terrific investment and/or second home opportunity! Rental projection on file projects $63k+ in annual income. 180 degree views of the Gulf of Mexico. Watch the sun rise over Alabama point to the east and set to the west from your balcony. Watch the kids play as the balcony also directly overlooks the outdoor pool. Gulf facing balcony in living room and master bedroom. Beautifully decorated in coastal cottage decor - featuring plantation shutters, relaxing blue, green, and gray tones, updated light fixtures, granite counters in kitchen and much more. Unit is sold as viewed, rental ready with a few exceptions. (See docs for details). Property will sleep 8 guests for rental purposes. Don't miss this great opportunity! 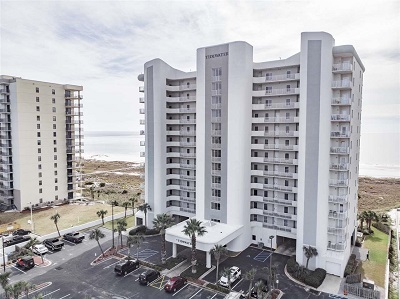 Tidewater is a gated, direct gulf front complex. The complex features a large gulf front outdoor pool, indoor pool, fitness room (gulf side), hot tub, and steam room! Conveniently located in Orange Beach but outside of the most congested areas along the Perdido Beach Boulevard. Beautifully landscaped and well maintained. The complex has plenty of parking and also features a covered entryway with an interior elevator lobby.